A day before yesterday, while crossing the The Body Shop counter. I realized with a jolt, I need those Gloves! I've used them once with Johnson's Baby top to toe wash. I've used Poofs and Exfoliators made from Natural fibre (Coconut), They kind of scratch my skin. 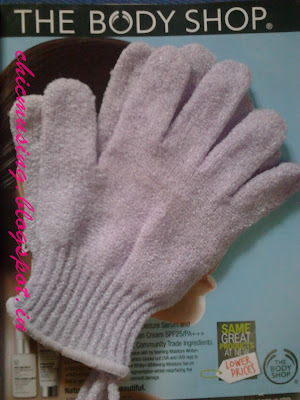 I've had many horrendous experiences with Body Exfoliators.The Vega Bath gloves were made of the material same as the Loofah, let alone exfoliation it did nothing more than tickling. But Now I have, What I always needed! A Scrubby Gloves. Fits the palm perfectly! The Vega gloves did not fit and would move a lot. Very little amount of Shower gel/Wash is needed. These should be used twice or thrice a week and not everyday. Nothing, I want the Coral Pink coloured next! I'm totally in LOVE with these! These make the bathing experience much more likeable.